The couple made contact with Schnauber via the application form on the website. Our Sales and Business Development Manager, Marius, arranged an appointment to see them. He found that they had already been in touch with numerous companies and had received numerous quotations. Was the competition going to be tough? 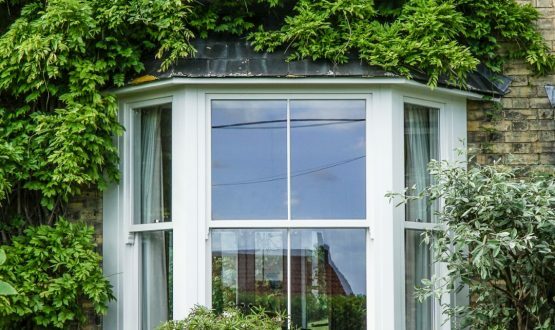 From their initial conversation Marius understood that the Thompsons were looking for a traditional timber sash window to retain the integrity of their period home but that they were also looking for a level of technical expertise that would result in improvements being made to the thermal efficiency of their home and security. Marius was able to satisfy the requirements of Mr & Mrs Thompson – and their parents. Once on site Schnauber’s team of installers found that the internal plaster was far from well preserved. The age of the property had taken its toll on the plaster, it was extremely delicate. 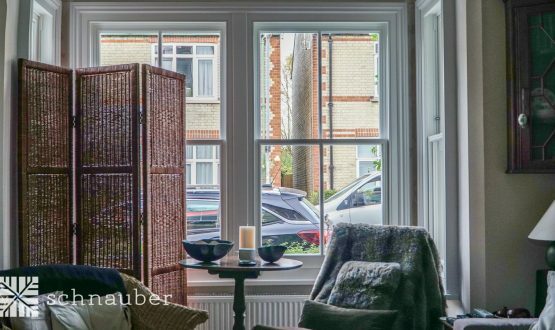 The implication of this discovery was that the existing sash windows had to be removed in individual pieces in order to minimise any possible damage to the existing building. An additional complication arose when the team identified that the buildings foundations had sunk slightly. The installation team took everything in their stride and adapted their working practices accordingly. From start to finish the installation took twelve days to complete. Mr & Mrs Thompson both agreed that the work carried out was of the highest standard. Their expectations were exceeded and they applauded the Schnauber team for their high level of adaptability when faced with such a difficult property. The new sash windows and entrance door helped to improve the warmth and security of their home. The couple have recommended Schnauber to their family members and we are currently manufacturing products for that project.